We’d love your help. Let us know what’s wrong with this preview of Dead to Rites by Ari Marmell. To ask other readers questions about Dead to Rites, please sign up. 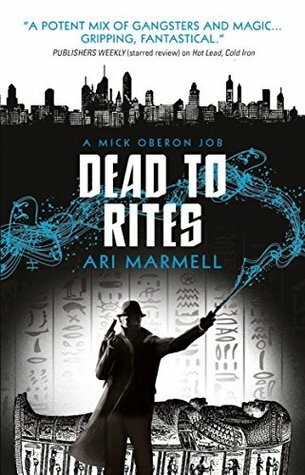 Dead to Rites by Ari Marmell is the third book in the Mick Oberon series. When I first picked up the book, I didn't realize that that was the case. I was hoping that I'd be able to pick it up fairly easily, but in hindsight I should have started in on book one first. I think I'll have to go back to the beginning of the series with Hot Lead, Cold Iron. Shorter and not as fulfilling as the previous two books. Mick Oberon spends much of his time confused, rushing from place to place, and so do we. But, I still adore this series for its wacky uniqueness. (Oberon knows how to snark like a pro) I hope we get to see more of Mick in future. An improvement over the second novel, but not the first. The plot was decent, and Mick’s voice is polished to a shine, as usual. Ramona fits the not-quite-villainess role surprisingly well, much better than the ‘very shady femme fatale love interest’ position she occupied in the last book. The new love interest, Tsura, however, is rather underdeveloped, and has little to credit her beyond being weirdly competent at times and weirdly incompetent in others. Mick also doesn’t gain much character development in this book, which is rather disappointing, and unlike the first, there is no real “theme” present. Mick is still hilarious, his magic is still fascinating, and his world still feels broad; unfortunately, there’s little new ground tread here. Despite those caveats, the search for the mummy here does yield some interesting finds. Like the other two books, this one features a ‘guns-blazing’ climax, where everyone involved is gathered in one place, but the plot twists were clever and satisfying. Marvel continues to expand his repertoire of Fae, which is always a treat. Past characters also make reappearances, including a surprise from an amateur witch, and of course the Ottatis, perhaps the world’s most amiable gangsters, are yet to truly get their happy ending. Even so, the story is strong enough to stand on its own, and all plot-important references—such as Mick’s determination to wake the sleeping Ottati—are fully explained. I like this kind of book, urban fantasy with magic and creatures, etc. The detective bit has been done many times but the setting is charming, 1930s Chicago. Lots of mov activity and quaint language. The series is going downhill in my opinion. I don't care for the place or time, or private detective stories, but hoped there'd be something magical in the story. If Mick is trying to turn himself into a common human, with nothing likeable or respectable about him, he seems to be succeeding. I also hate books where the character does something really stupid and out-of-character, just for the benefit of the plot. Having him ignore the prophet's warning after she'd proven her credibility numerous t The series is going downhill in my opinion. I don't care for the place or time, or private detective stories, but hoped there'd be something magical in the story. If Mick is trying to turn himself into a common human, with nothing likeable or respectable about him, he seems to be succeeding. I also hate books where the character does something really stupid and out-of-character, just for the benefit of the plot. Having him ignore the prophet's warning after she'd proven her credibility numerous times, was just plain stupid. Fae, gangsters, an Oracle and an Egyptian mummy? What more can you ask for? A well-paced story, and some interesting new characters we get introduced to. Not sure we’ll see more of them in the next volume, but maybe volume 5 we’ll see one of them again. More with Ramona Webb as well, getting to learn more about her. Not as much with the rest of the Fae in general. But some fun stuff with the gangsters helps make up for it. And of course it ends with a major reveal to lead into the next volume. Best read in chronological order. In A NutshellMick our fae private eye has lost his mojo. So sets off to recover it. But the path of a fae PI is never straight. We meet gangsters, an Oracle and an ancient Egyptian Mummy. And some of that is entertaining. But it was not just Mick's mojo that was missing. I think this book lost its way. It overegged the pudding. On this occasion, a little less magic would have been more. But to know Mick is to love him, so I hung on in there. If you read it don't hold great expectations. This series probably isn't for everyone. A mix of Chicago gangland, the fae, a private investigator and lots of slang. On the other hand, if that sounds interesting try Hot Lead, Cold Iron. I enjoyed this installment in the series and I am looking forward to the next one. A 1930s hardboiled Chicago PI, with connections to more than the underworld. He's a fae that packs a wand instead of a gat. He gets into trouble with dames that can fly. The book is written in slang, which was a little hard to get used to but oddly worked. The mystery was pretty tight and the characters were well written. I like urban fantasy. I'll definitely read more by this author. I liked this one better than the previous two. Was more of a fulfilling story. Also, Fedora. Good sequel in this series. Your kept guessing who the real bad guy is until the end. More background on Mic in this book. This has been one of my favorite urban-fantasy trilogies. I would love for the series to continue! Very good series. Great to read while waiting for a new Jim Butcher book. When Ari Marmell has free time left over between feeding cats and posting on social media, he writes a little bit. His work includes novels, short stories, role-playing games, and video games, all of which he enjoyed in lieu of school work when growing up. He’s the author of the Mick Oberon gangland/urban fantasy series, the Widdershins YA fantasy series, and many others, with publishers such as D When Ari Marmell has free time left over between feeding cats and posting on social media, he writes a little bit. His work includes novels, short stories, role-playing games, and video games, all of which he enjoyed in lieu of school work when growing up. He’s the author of the Mick Oberon gangland/urban fantasy series, the Widdershins YA fantasy series, and many others, with publishers such as Del Rey, Titan Books, Pyr Books, Wizards of the Coast, and now Omnium Gatherum.